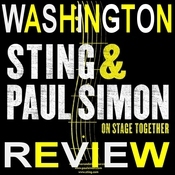 Even the T-shirts at the memorabilia counter reflect the respect Sting and Paul Simon have for each other. One shirt reads "Paul Simon and Sting, On Stage Together." 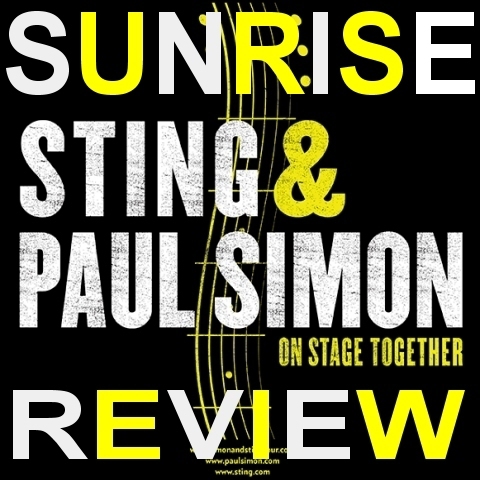 A second flips the billing, with "Sting and Paul Simon, On Stage Together." This is a clear musical bro-mance, sparked by a concert in New York last May with the two Central Park West. Then followed their grand idea - "let's tour together!" - and that tour stopped at the BB&T Center Sunrise Saturday night. OK, we get it. Sting will be his bodyguard, Simon will be his long-lost pal.The pairing also a.) pools their audiences and b.) puts them in a large arena, under the name of traveling down the same musical path. Hey, business is business. They're not here to be cartoons in a cartoon graveyard. It was the next-to-last stop on their tour, and they have it down cold- but they also had plenty of bounce in their steps. The pair opened on stage together with "Brand New Day, " "Boy in the Bubble," "Fields of Gold" and "Every Little Thing She Does is Magic." Backed by a dozen or so musicians, the songs allowed them to poke and prod at every rhythmic crevice together - a habit they've long held on their own. Quick note: I always hold my breath whenever I see two drum sets out there. But in this case, each drummer held back nicely when his singer was away from the mic. You'd expect nothing less, after the two stars set such a loving tone. The pair's limited banter is down pat, too, by now. Simon commented that his time with Sting has elevated his virility - a line he has offered at most other shows, according to reviews. Sting called Simon "the template for literary songwriters," a line, he too, has found successful this tour. The crowd seemed to enjoy the night, without going wild. Simon, 72, and Sting, 62, skew older in their fan base, and maybe folks were just too pooped to stand up. But with these rhythms, even the 99.9-percent white crowd could sashay to without looking too bad. Song choice also slowed things down: Sting's pensive takes often aren't pepper-uppers (even Police rocker "Roxanne" is a grim plea), and Simon's honest assessments - such as the wistful "Still Crazy After All These Years" - are geared toward thoughtful listening. You also can argue that's what makes them so good, the getting into the gray areas of life and their observations. They'd rather lose you in esoteria than be mindless. Sting's set included the more-obscure "The Hounds of Winter," "They Dance Alone" and "Message in a Bottle." Was it really back in 1984 when I first saw the police, in St. Louis? Geez. Meanwhile, Simon gave us "Me and Julio Down by the Schoolyard," "Diamonds on the Soles of Her Shoes" and "You Can Call Me Al." All really good choices, but how could there be a bad one? The finale together started with "Bridge Over Troubled Waters," with Sting just flat-out belting the closing notes - who does this guy thing he is, Art Garfunkel? - and Simon holding in there nicely for the Police's "Every Breath You Take." Simon's "Late in the Evening" gave us one more spell of multi-percussion rhythms, then the pair ended with an acoustic of The Everly Brothers' "When Will I Be Loved?" made popular by Linda Ronstadt and dedicated to Phil Everly, who died earlier this year. Stripped-down music, with two superstars trying to make each other better - and keep up with each other. They may be soft in the middle now, but the rest of their life certainly isn't hard. For more reviews from the Fort Lauderdale show please visit http://www.sting.com/tour/date/id/2911 where you can view the setlist, leave your comments about the show, post images of your ticket stub and your photos from the show!